A commercial promoting the Laforet Grand Bazar winter sale in Harajuku (January 20-24) features a mob of people with flickering LED-illuminated smiles who overrun a dramatic love scene reminiscent of a popular '90s-era TV show. 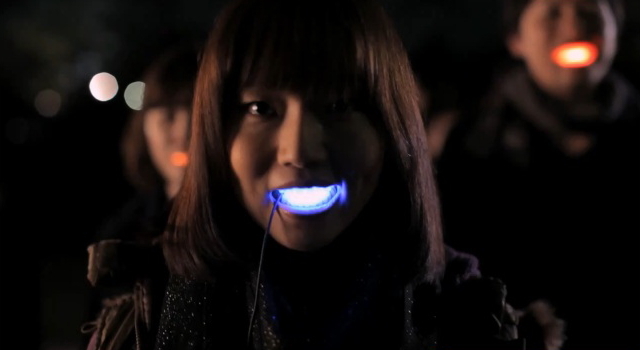 The ad -- entitled "Geee / Harajuku Love Story" -- makes use of wirelessly-controlled Mouth LED technology developed by artists Daito Manabe and Motoi Ishibashi. Here is a rough translation of the dialogue that takes place as the smiling mob approaches. [Man]: We can make it work. I'll do my best. [Woman]: Will you come to see me if I get lonely at night, no matter what? [Man]: I will go immediately. I'll fly. [Woman]: Will you come and pick me up if I call you from Mt. Everest? [Man]: I'll fly there right away. [Woman]: Will you bring me hot nabe soup if I ask for it? [Man]: I will. I'll bring a year's worth. [Woman]: What if I asked you to take me to the moon? [Woman]: That's not good enough. [Man]: But I can make you happy. The commercial appears to have been inspired by an earlier project by Manabe and Ishibashi entitled "Party in the Mouth," which featured a mob of women with glowing LED smiles wandering the streets of Tokyo at night. This is creepy...like souless fake smiling robots with light up mouths. Just creepy. They really need to figure out a solution for that wire. I would accept it better without that there. Interesting, there's a story in the Japan times today : http://search.japantimes.co.jp/cgi-bin/fd20110130a1.html about how the foreign media have picked this up as the latest fashion trend amongst Japanese schoolgirls! did it start here perhaps?